ACHARYA himself; timeless furniture; books; and, personal memorabilia. Today it is stands as a monument to many-sided personality and eclectic taste of Acharya Bose. Many of his path breaking experiments on responses of plants to various stimulii, radio waves, etc. were carried out in this house, Acharya Bhaban. Hidden inside is a different world where arts, science, literature and nationalism of the early 19th century blend seamlessly. Because of lack of funds required for maintaining the priceless items in Acharya Bhaban, signs of wear and tear are conspicuous. Fortunately, the Ministry of Culture, Government of India,has come to the rescue and provided a portion of funding to carry out some restoration and prevent irreversible wear and tear. However, a large quantum of money is still required to maintain Acharya Bhaban, which is essential for the preservation of our history of science and society. Most funding agencies, including philanthropic agencies, require the Trust to come up with a matching grant in order for them to provide a grant. It has, therefore, become essential to build a reasonably large corpus fund, of the order of Rs. 1 crore. 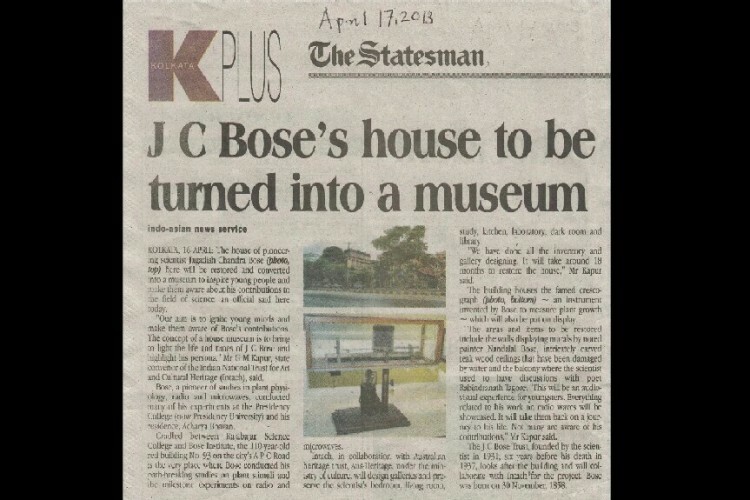 Trustees of Sir J C Bose Trust fervently appeal to all to donate generously so that the legacy of Acharya Jagadis Chandra Bose and an important part of the history of modern Indian science can be preserved. Your share could be as good as a donation for Sir J C Bose Trust! Not everyone can afford to take care of their loved ones. Sir J C Bose Trust's life can only be saved by donations made by kind people like you.